One of the ways to make a deck exceptional is to incorporate built-in features during the planning process. 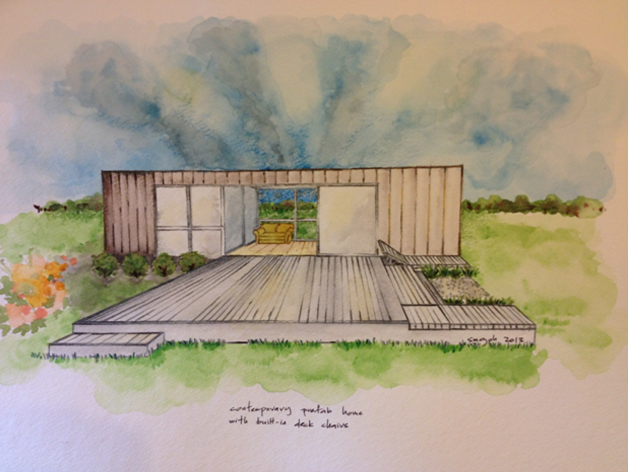 A built-in fixture is crafted as part of the deck structure and can be both utilitarian and decorative in nature. When designed and built correctly it flows smoothly with a seamless appearance and looks great with your settings. Another advantage is you can minimize furniture on your decks. More often than not homeowners have limited areas for their extensions so integrating seating systems, screens and furniture usage into a deck gives more value for your investment. A fixture that is permanently placed designates its usage and eliminates the clutter of unnecessary pieces. Railings are important to mark off boundaries and provide support as well as safety. The balustrade or spindles are positioned to prevent accidents and can make a design statement depending on your personal preference. 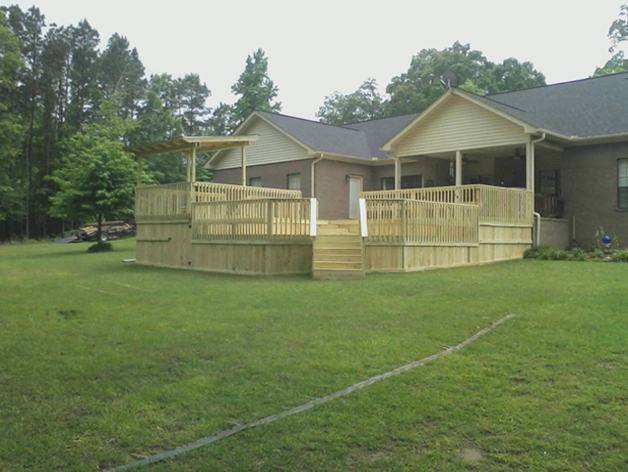 By extending two railing posts from the standard 38” to 42-45” high and adding 2 or 3 pieces of decking board horizontally above them, a bar counter can be easily built. If a garden look is desired, a similar approach can be done by installing tall rail posts and adding rafters across for an overhead trellis. 2” x 2” top pieces can then be added on to provide a measure of shade and shelter. A railing section can be crafted creatively to form the back of a bench at an angle or fitted in a uniform fashion with partitions and lattices. Benches, side tables, planter boxes or combinations of these features can be built alongside railings to form softer boundaries and made functional at the same time. Barbecue areas, outdoor kitchen counters with sinks and water feature elements can all be integrated to flow and blend evenly with the overall construction. In lieu of railings, benches are the perfect structure to build on a deck. In outdoor living settings, built-in benches are strong and look very inviting. 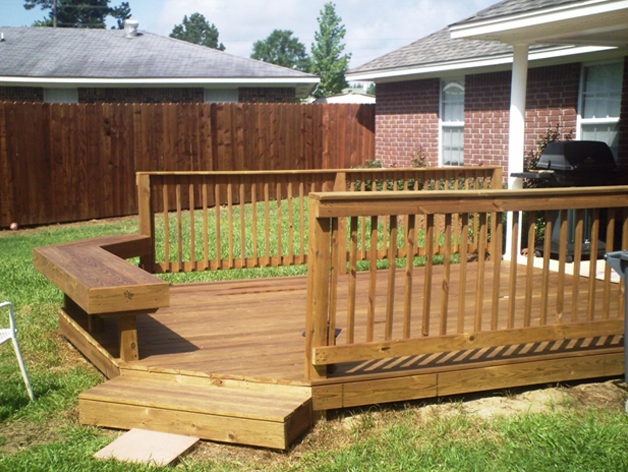 However, substituting benches instead of railings is only suitable for ground or low level decks and porches. Free standing benches on the other hand will help to maintain the outdoor look but provide flexibility in arrangement. Coffee tables can also be built the same way as a built-in bench but typically lower and wider. Another interesting feature that can be formed on deck floors is a built-in deck chair. On a low rise deck a suitable area is selected for relaxing and sun tanning. A rectangular section between the floor joists can be crafted to simulate the back of a deck chair and made to lift up in several positions. To make the space more comfortable, cushioning in outdoor fabric can be added on. When not in use, this built-in unit is flush with the deck floor, providing ample space for other uses. There are a great number of possibilities when it comes to putting together built in features for your deck. Making them work for your needs and wants each day will bring out the best in your outdoor living experience.